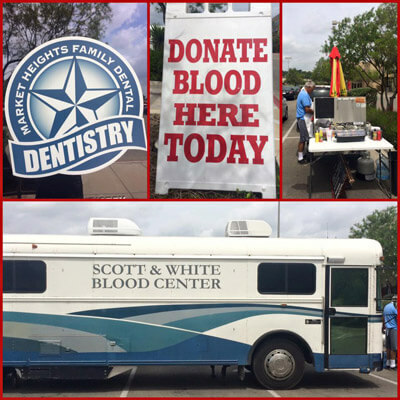 Market Heights Family Dental and Scott and White Healthcare Blood Care Center partnered together in July 2015 and April 2016 to host "Donation Nation" a company-wide blood drive throughout central Texas. We are offered oral cancer screening vouchers and other goodies to all donors. We are proud to give back to our community and was recognized with the 2015 Community Hero Award, Outstanding Corporate Blood Drive as well as an outstanding coordinator award. Market Heights Family Dental has proudly supported Food for Families and the food pantry in Killeen since 2012. This year Market Heights Family Dental collected 11,785 pounds of food for donation! Market Heights Family Dental is committed to educating our community about the risks of oral cancer and believes that early detection saves live. Each April MHFD hosts a free oral cancer screening event to spread awareness about this silent killer. Each year close to 43,250 Americans will be diagnosed with oral cancer. It will cause over 8,000 deaths, killing roughly 1 person per hour, 24 hours per day. Of those 43,250 newly diagnosed individuals, only slightly more than half will be alive in 5 years. Early detection may save your life. Learn More.